Trees to 14m; trunk to 0.5m diam., strongly tapering, much branched; crown usually rounded, dense. Bark red-brown, irregularly furrowed or cross-checked, scaly. Branches spreading and ascending, persistent to near trunk base; twigs stout, orange-brown, aging brown to gray, sometimes sparsely puberulent. Buds ellipsoid, light red-brown, 0.5--0.7cm, resinous; scale margins fringed. Leaves 1(--2) per fascicle, ascending, persisting 4--6(--10) years, 2--6cm ´ 1.3--2(--2.5)mm, curved, terete (though often 2-grooved), gray-green, all surfaces with stomatal lines, margins entire, apex subulate; sheath 0.5--1cm, scales soon recurved, forming rosette, shed early. Pollen cones ellipsoid, ca. 10mm, yellow. Seed cones maturing in 2 years, shedding seeds and falling soon thereafter, spreading, symmetric, ovoid before opening, broadly depressed-ovoid to nearly globose when open, 4--6(--8)cm, pale yellow-brown, nearly sessile; apophyses thickened, slightly raised; umbo subcentral, raised or depressed, nearly truncate, apiculate. 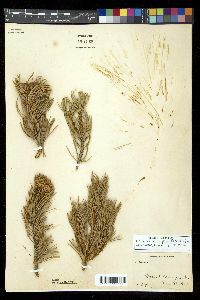 Seeds cylindric-ellipsoid; body 15--20mm, gray-brown to brown, wingless. 2 n =24. 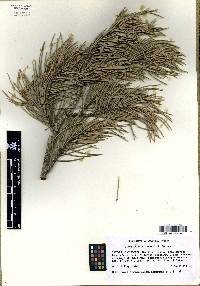 Dry low-montane or foothill pinyon-juniper woodland; 1000--2300m; Ariz., Calif., Idaho, Nev., Utah; Mexico in Baja California. 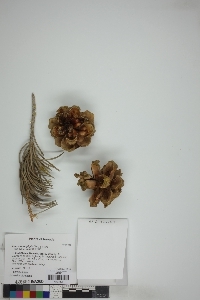 Pinus monophylla hybridizes with P . edulis and P . quadrifolia . Singleleaf pinyon ( Pinus monophylla ) is the state tree of Nevada.